two tone Egyptian earrings in Sterling Silver and 14K gold filled. 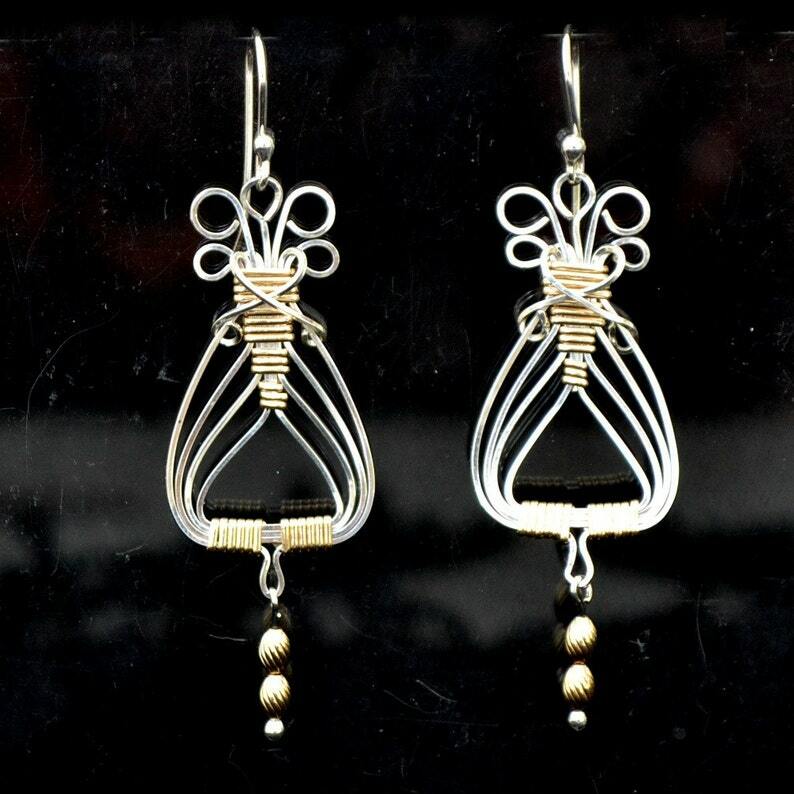 Sterling Silver and 14K gold filled wire combine with wire wrapping to make these Egyptian style earrings. Lightweight on your ears but sturdy. Handmade. Average time to make these is 1-2 days. The dangling beads are also 14K gold filled and the earrings hang 2-3/4" from the finest sterling earwires that come with rubber earnuts. Interested in a matching bracelet? see this lisitng: http://www.etsy.com/listing/77246374/egyptian-bracelet-wirewrapped-sterling I also make a matching pendant. Contact me for photos if interested. Thanks for looking. Please leave a heart where your mouseprints have been if you like what you see. Sterling silver wire wrap bracelet with 14K gold filled accents. "Serendipity"
Angel earrings in sterling silver or 14K gold filled. Wire wrapped earrings. Skirt style B.
Egyptian sterling silver and 14K gold filled wire wrapped earrings or jackets "Cleopatra"
RuLaLa Sterling silver and 14K gold filled wire wrapped bracelet. Egyptian wire wrapped earrings. 925 Sterling silver 14K gold filled accents. Sterling Silver or 14K gold filled dangle earrings "Open Heart" 2 inches. Egyptian wire wrapped Bracelet with a Twist. Sterling Silver and 14K Gold filled.